To create transactionally consistent backups and replicas for VMs that do not support Microsoft VSS (for example, Linux VMs), you must enable Microsoft Hyper-V guest quiescence for the job. 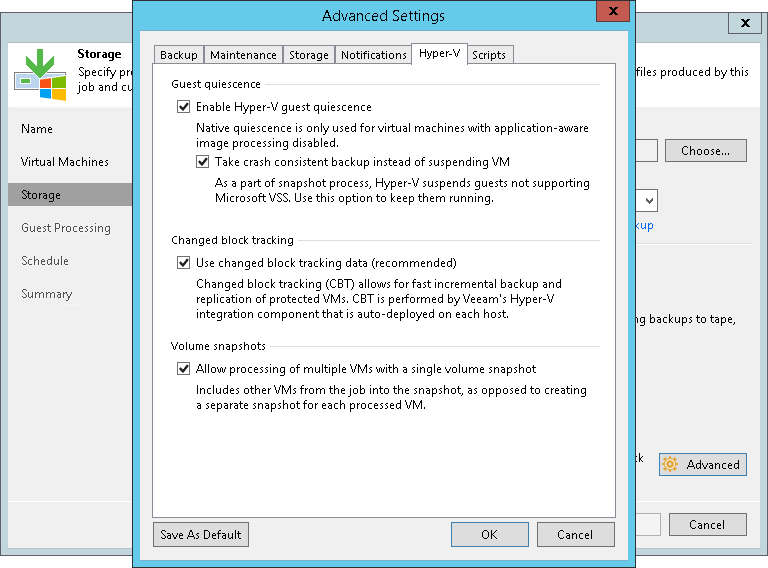 In this case, Veeam Backup & Replication will use a native Microsoft Hyper-V approach to quiesce the VM. Microsoft Hyper-V guest quiescence helps freeze the file system and application data on the VM and create a stable shadow copy of the volume where VM data resides. To create consistent backups for such VMs, applications should be prepared using special pre-freeze and post-thaw scripts that you should create and store on the backup server beforehand. When the job starts, Veeam Backup & Replication will upload these scripts to the appropriate folders on VM guest. For more information, see Pre-Freeze and Post-Thaw Scripts. If a VM meets all requirements for online backup, Veeam Backup & Replication will use the online backup method. If a VM does not meet requirements for online backup, Veeam Backup & Replication will use the offline backup method. During offline backup a VM is suspended for a short period of time. If you do not want to suspend the VM, you can instruct Veeam Backup & Replication to create a crash-consistent backup instead of creating a transactionally consistent backup with the offline backup method. Microsoft Hyper-V guest quiescence is enabled at the job level for all VMs added to the job. By default, this option is disabled. Offline backup is not applicable to VMs registered on Microsoft Hyper-V Server 2016.